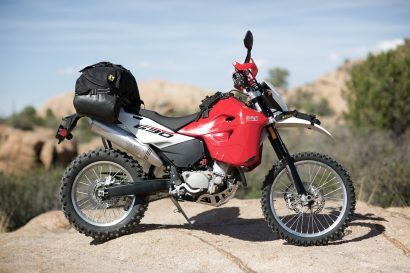 For the adventure motorcyclist, there has long been a division between riders who prefer the traditional elements of an off-road helmet, and those who like the convenience of a flip-front modular lid. Like many, I have one of each making for a difficult choice every time I slip out the door. You can count me among the legions of loyal Schuberth fans who continually asked for a hybrid and we now have it in the form of the recently released E1. The most noticeable feature of the new model is the large and robust peak visor, a hallmark of any good off-piste helmet. On closer inspection, there are several other attributes of the new German helmet that set it apart from its predecessors. Building on the brand’s already proven shape of their modular C3 Pro, the E1 retains most of the features many of us have come to love over the years, but with the introduction of only a few modest alterations. The shell is still made in two sizes to accommodate XS through 3XL sizes. 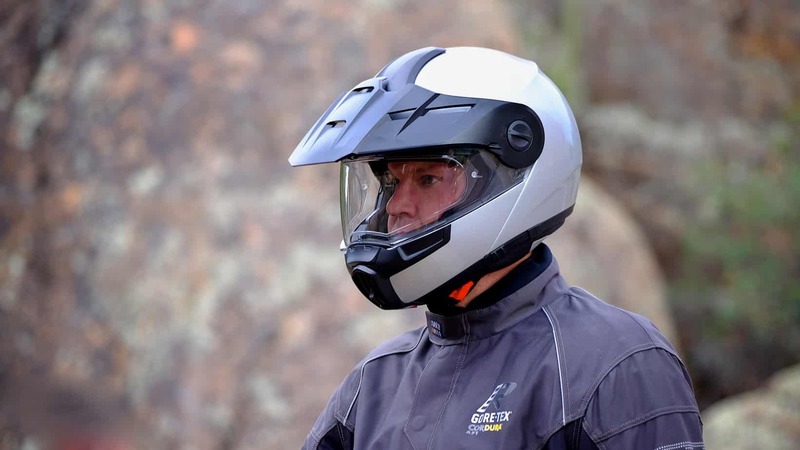 The chin bar is raised with the same push-button release, and as we would expect, the E1 retains the drop-down sunshield Schuberth first invented decades ago. 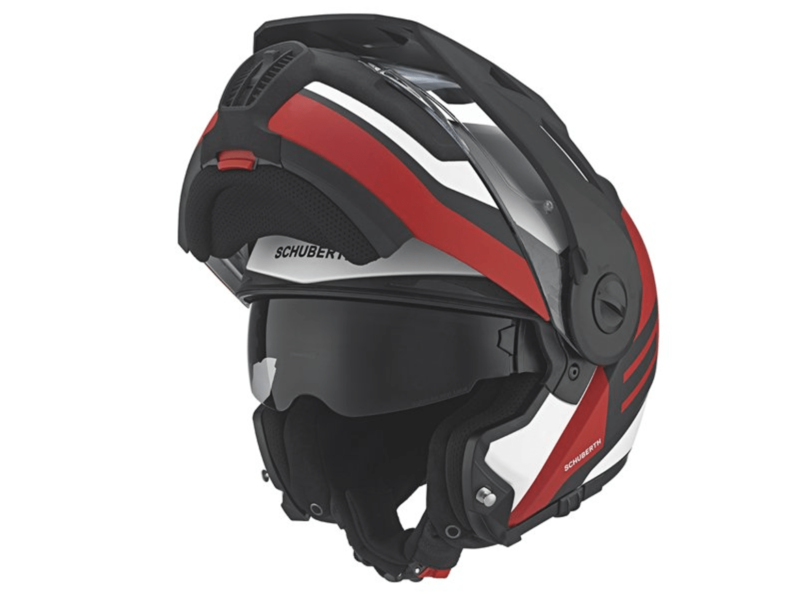 The E1 also has the internal antenna system used to bolster the range of Schuberth’s proprietary SRC wireless communication system, as well as an optional Pinlock anti-fog visor insert. There are other small refinements I have always appreciated about Schuberth helmets such as the quick-release chin buckle which can be disengaged easily with one hand. 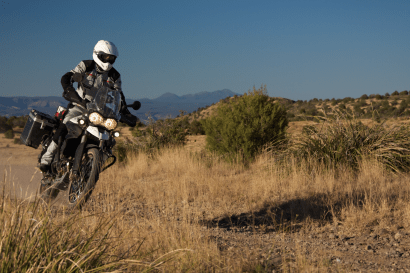 One of the primary considerations for any adventure helmet is the ability to import air while traveling at lower, off-road speeds. To this end the E1 has an enlarged chin vent backed with a removable and washable air filter. In preliminary testing the increase in air flow over the C3 Pro was immediately noticeable. On one particularly warm day with no threat of dust or debris, I removed the internal filter altogether to further improve air flow and the results were instantly comforting. The face of the E1 received significant changes over the C3 Pro including the removal of the two aerodynamic fins along the lower edge of the chin bar. Ideally designed to add stability on the C3 Pro, they were less effective on the E1 given the alteration to the aerodynamics with the addition of the peak visor. Just above the main chin vent are two scallops in the chin bar to help gloved hands quickly and securely locate the shield tabs. A large toggle on the chin vent permits a swift adjustment to air pass-through and the primary import vent atop the helmet is now easier to actuate having lost the small on/off tab it once had. Now the whole vent assembly slides fore and aft to open or close the vent. 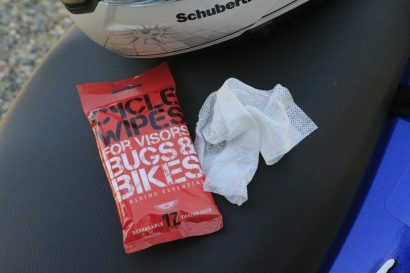 Other refinements include a durable fabric used along the neck roll to help fend off scuffs and tears when used in the rough and tumble world of off-road riding. This brings us to the star of the show, the large and nicely sculpted peak visor. A tremendous amount of engineering went onto the design of the pivot mechanism that not only facilitates the raising of the chin bar, but also slides the peak visor up and out of the way simultaneously. Even more impressively, once the chin bar is lowered, the peak visor automatically returns to its previous position above the shield. I was equally dazzled by how tightly packaged the peak visor is with the chin bar when lifted into its upright position. 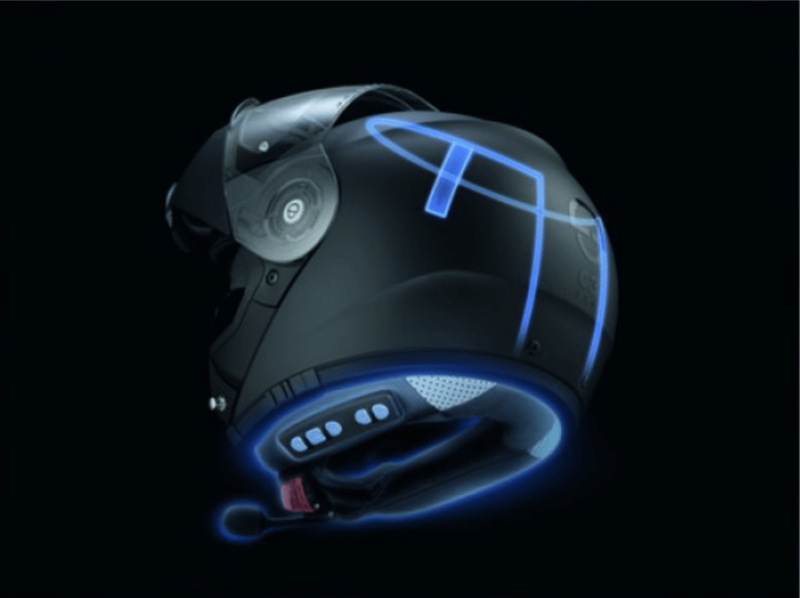 Unlike a surprising number of adventure helmets, the peak visor of the E1 can be firmly locked in one of three positions. It’s not easy to do on the fly as the peak locks in place with two small levers located on the sides of the main pivots, but I’ve found that I don’t move the visor once I find my preferred setting. 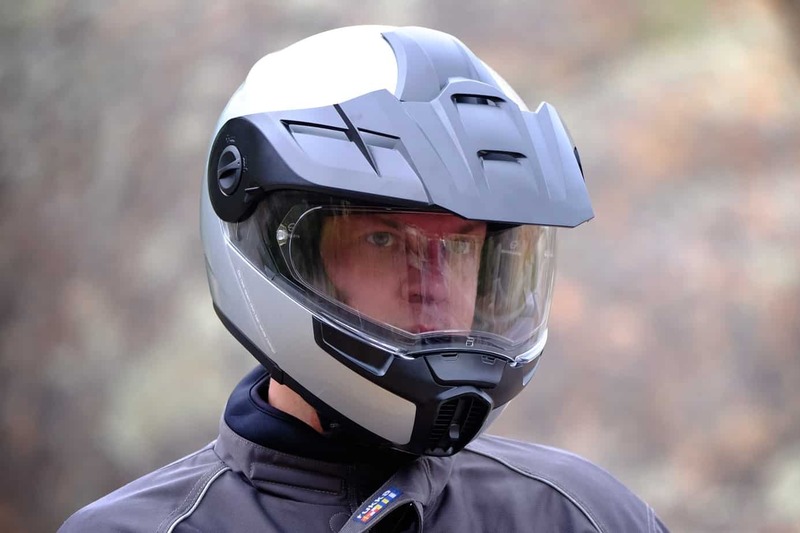 For riders hoping to eek out as much off-road performance as they can from their E1, the clear shield can be removed from the front of the helmet while retaining the peak visor. This permits the use of goggles, or at the very least sunglasses, but the advantage of a flip-front helmet is all but lost in that configuration. Although it does require the addition of two small outer pivot plates, the peak visor can be removed completely, but I don’t foresee many riders doing so. The optional Schuberth SRC-System Pro wireless communicator system integrates perfectly into the neck roll and mates with the E1’s built-in antenna for increased range and better clarity. It is one of the best communication systems I have used in several years and have logged more than 20,000 miles with my SRC. On the road I found the E1 felt very much like my previous C3 Pro, which is no real surprise––and welcome relief. The fit and finish are as refined as any helmet can be––and it should be given the $840 price tag. Schuberth claims they improved the quality of the fabric within the liner, and while I do think it is slightly nicer, I don’t know that I noticed it once the helmet was on my head. At speed I found the peak visor was quite stable, although there is no way to create such a beak without having it snag at some wind. I didn’t encounter any unwanted buffeting and assume Schuberth spent exhaustive hours with the helmet in their in-house wind tunnel. I also did not observe any unpleasant wind noise with the clear shield pulled up and into the recess of the peak visor. All in all, it is a very quiet, stable, and comfortable helmet just as I would have expected. Like the C3 Pro, the E1 has a large face aperture that affords excellent peripheral visibility in a more upright touring posture. Downward glances at gauges are not impeded by the chin bar and the overall ergonomics are superb. The fit is slightly more elongated than previous versions of the C3 creating less forehead pressure for most users. Available in seven beautiful color schemes including a few solids, Schuberth once again created a palate of graphics sure to please any would-be buyer. It takes a special rider to commit to a helmet of this caliber, but for those who do, the rewards are well worth it. I find I have less neck fatigue with my Schuberth helmets at the end of a long day, and that rings true with their latest entry, the E1. It was a long time coming but well worth the wait.